I have a disability with both my arms and shoulders, but Eva took on the challenge. She took extra time in helping to find the right type of gun that I could handle and showed me ways of getting around my disability to be able to hold and shoot a gun so I could hit the target. Participants learn the basic skills and knowledge for owning and operating a pistol safely. Students learn rules for safe gun handling; pistol parts and operation; ammunition; shooting fundamentals; range rules; shooting from various positions; cleaning a pistol; and continued opportunities for skill development. No guns or ammunition allowed in classroom. Owning a handgun is not necessary. Student responsible for ammunition. 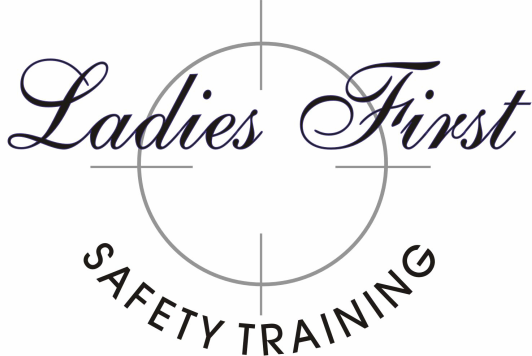 Contact Ladies First for course details, ammunition, pistol, and other equipment requirements. Must have basic pistol shooting course or are familiar with the safe operation of your firearm. This is an introduction to handgun competition. Firearms safety and basic handgun fundamentals are a must. Student will learn how to present a gun from holster, move and shoot from different positions. Ladies Armed Shooting Society - Match Location is Moving! Non-Firearms Course available at various locations. Refuse To Be A Victim® is a personal safety program that teaches strategies you can use to avoid situations where self-defense is required. This course focuses on proactive courses of action, rather than reactive. Criminals prefer easy targets. By making yourself more difficult to prey upon, you lessen your risk of criminal attack. That means having a personal safety strategy in place before you need it. The Refuse To Be A Victim® seminar covers topics that pertain to both men and women. The information covered is appropriate for young adults to senior citizens. Materials provided.